Date of birth: 15th of October 2000. Place of Birth: Westville Hospital, Durban. Home Town: Hillcrest. Introduction to your sport: Cycling has been a passion of mine since I was introduced to it by my dad when I was just three years old. Since then I’ve grown to love the sport and all the challenges it brings – whether it be on the Mountain Bike or Road. 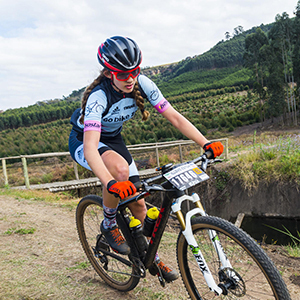 Career Highlights: My career highlights include winning SA Cross Country Championships six times; winning four national titles this year across the road and mountain biking disciplines, as well as placing in the top ten at two international events last year in Europe. My biggest achievement would be being selected to represent South Africa at the Mountain Bike World Championships both in 2017 and 2018, competing both times and gaining much experience. I’ve also been selected to represent South Africa at the World Road Championships in both 2017 and 2018. Favourite food: Definitely a tie between pizza and pasta. How do you spend your down time: I enjoy spending my down time through writing or photography as well as reading. Specialist events: Road (Time Trial, Road Races and Criterium) and Mountain Bike (Cross Country and Marathon) races. Importance of the EADP for you: EADP has played a huge role in the development of me as a rider by allowing me to have access to world class facilities just a half an hour’s drive from home. Everyone at Prime involved in the EADP program has really been supportive of my cycling journey. Favourite Drink: My favourite drink is most probably just plain, still water or a chocolate milk.